This post is sponsored by my friends at Vitamix. As always, all opinions, photos, videos and the recipe are completely my own! I get so excited when I find healthy snacks that my kids love! And I can’t even tell you how much they enjoy this chocolate hummus recipe. My other kids also adore this chocolate hummus! After the entire first batch had been eaten, all three of them asked me every single day if I would make more…until I did. 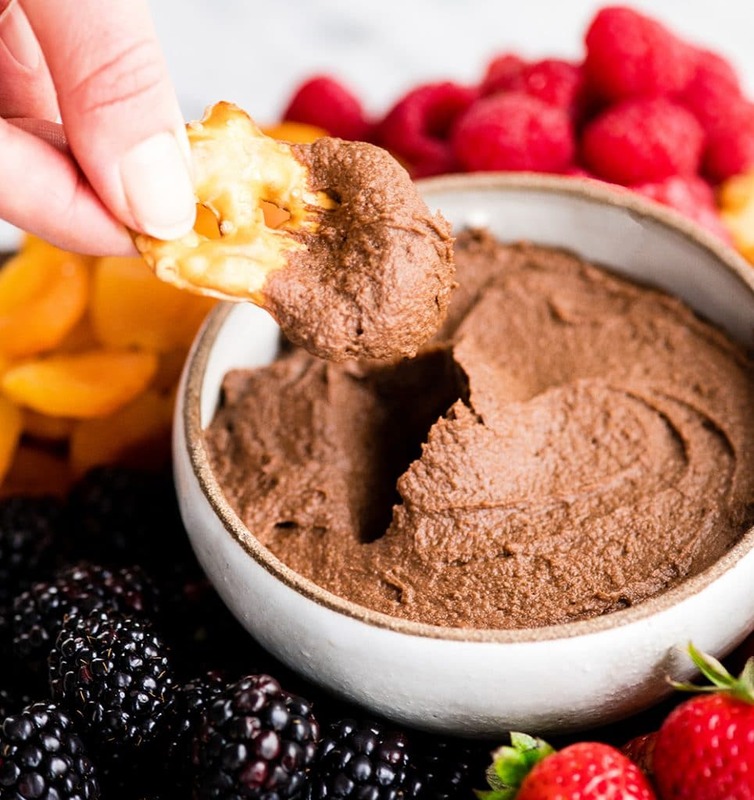 This Chocolate Hummus recipe is so great because not only is it healthy and family-friendly, but it’s easy to make and ready in 5 minutes! Plus it’s gluten-free, dairy-free, has no refined sugar & it’s vegan! How do you make Chocolate Hummus? This chocolate hummus recipe is so easy to make that it literally is ready in 5 minutes from start to finish! However, here are a few notes to ensure your dessert hummus making success! Rinse & Drain Garbanzo Beans! 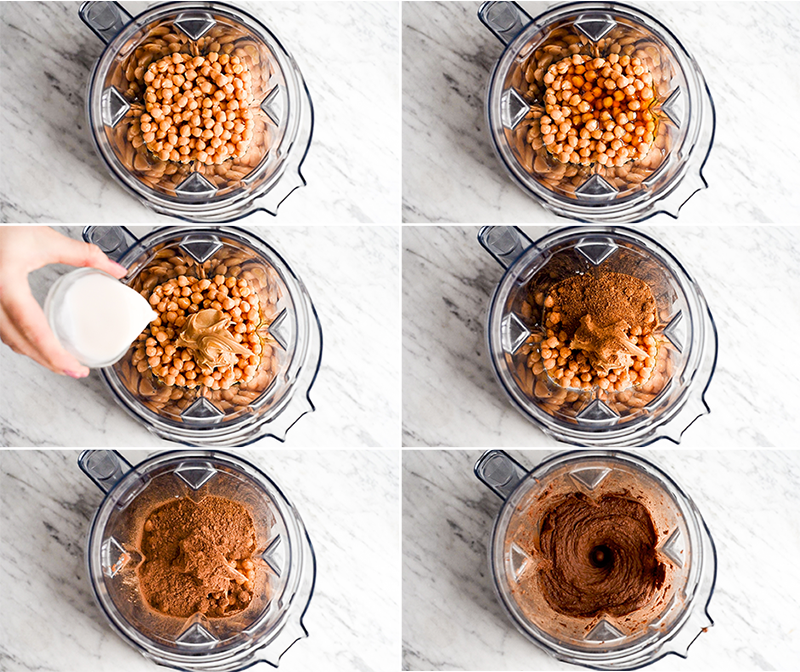 The first step in making this chocolate hummus is rinsing and draining the chickpeas. Make sure to use warm water (not cold) to rinse them, because warm or room temperature ingredients blend better than cold ones! Add ingredients in the order listed (wet first). When blending in a Vitamix it’s very important to add the wet ingredients first. This ensures there is enough liquid at the bottom of the container to get the blending process started and to ensure a smooth and even blend. Scrape down the sides and resume blending. Depending on the size of blending container you have, you may need to stop blending, use a spatula to scrape down the sides, and then resume blending. Sometimes peanut butter can get stuck to the sides and it’s important to make sure all the ingredients are incorporated and the mixture is homogenous (uniform throughout). Add more almond milk if necessary. 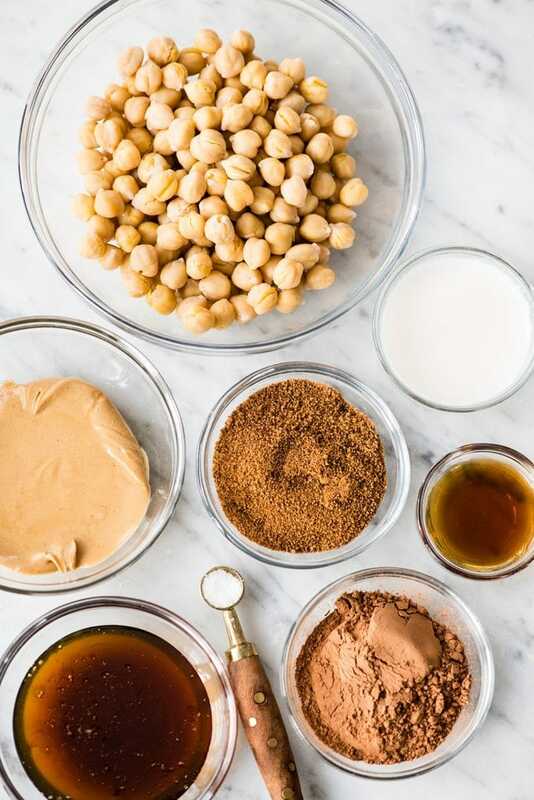 I did not have to do this, and 2 TBS was just right for me every time I tested this recipe, however there are many factors (consistency of your peanut butter, moistness of the chickpeas, etc. etc.) that could effect the amount of almond milk needed to achieve the perfect chocolate hummus consistency. I recommend adding 1/2 – 1 TBS at a time. 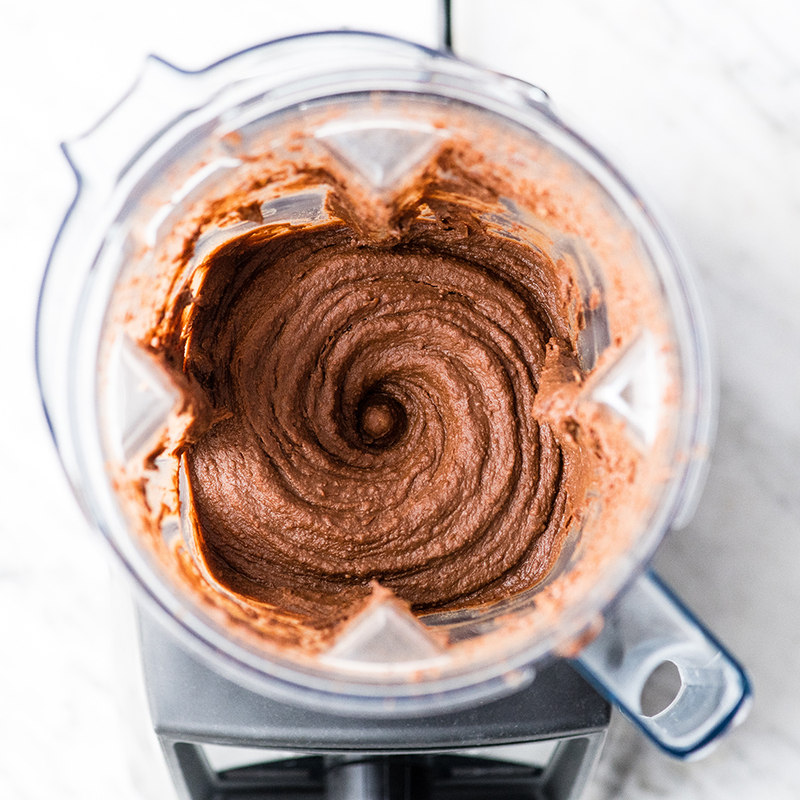 If you’ve been around my blog for a while this should go without saying, but the best way to achieve the ultimate creamy dreamy chocolate hummus you can is by using a Vitamix blender! Sure you can use a lesser blender or a food processor to make this chocolate hummus recipe, it’s not a difficult one to blend. However, if you don’t have a Vitamix yet I highly recommend getting one ASAP! 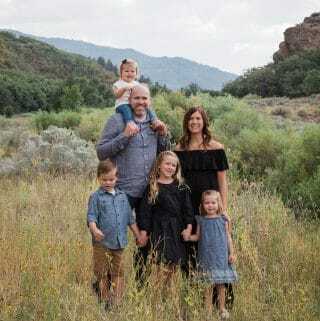 Check out my Vitamix Buying Guide where I give my exhaustive reasons for choosing a Vitamix blender almost a decade ago, and give my top recommendations about which model to buy! I mean come on, check out that chocolate vortex! Homemade Chocolate Hummus: more than just a dip. 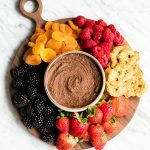 Sure this Chocolate Hummus can be served as a fun dip, appetizer, dessert or snack….but it also makes a great spread. Move over Nutella, there’s a healthier (and dare I say tastier) creamy chocolate spread on the scene! Smear this Chocolate Hummus on toast made with homemade bread, banana bread, muffins, french toast, pancakes, waffles, etc. etc. 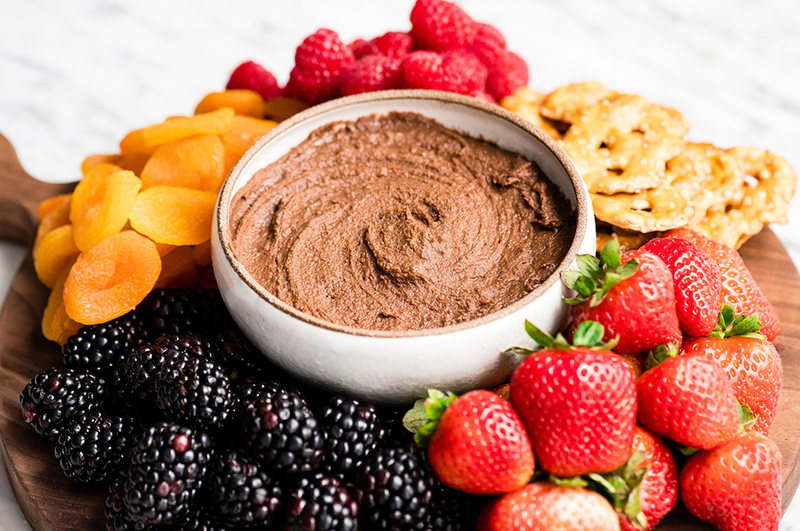 There’s no limit to the delicious ways to enjoy this healthy Chocolate Hummus! How long does chocolate hummus last? This hummus lasts for 7-10 days when stored in an airtight container in the refrigerator. However, it doesn’t stick around my house that long! 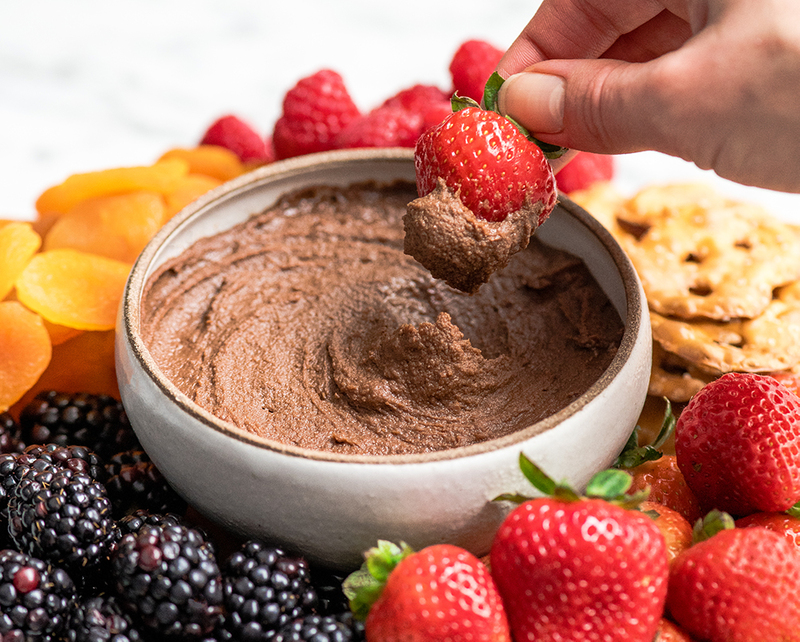 This chocolate hummus recipe is much healthier than other chocolate dips or spreads that you can find on the market (like Nutella or store-bought varieties). The main ingredient, chickpeas, has many health benefits! Chickpeas are high in fiber, which means that they help lower blood sugar & cholesterol, and aid in digestion. They’re also rich protein which helps you feel full and energized! However, this Chocolate Hummus is a treat, so as always I recommend consuming it as part of a balanced diet and enjoying it in moderation! 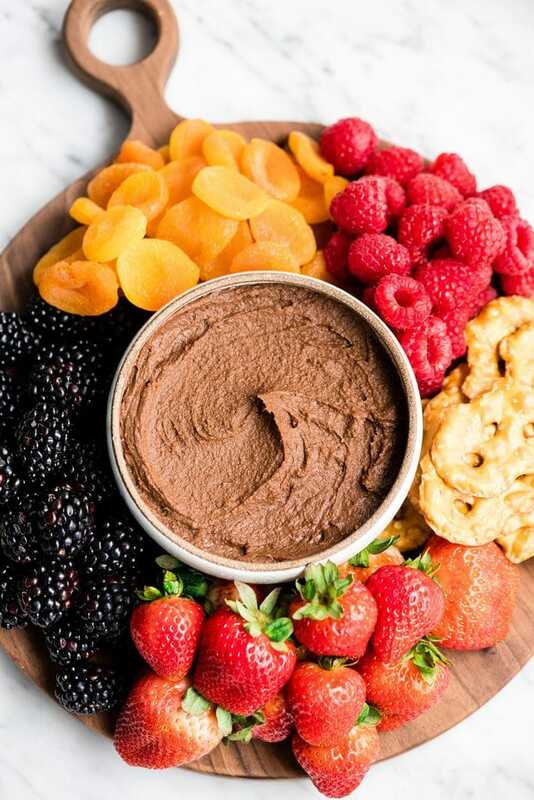 What can you dip in chocolate hummus? Berries – strawberries, raspberries, blackberries, blueberries, etc. Citrus fruits – orange slices, clementines, grapefruit, etc. Other fruits – apples, pears, bananas, kiwi, etc. Dried fruits – apricots, berries, apples, etc. Pretzels – any variety works great, pretzel crisps, twists, rods, etc. Graham Crackers – graham cracker sticks are a fun serving option, or regular graham crackers broken into smaller pieces. What can I add to chocolate hummus? You can have tons of fun by adding different flavors and extracts to this Chocolate Hummus recipe! Blend in some raspberries for a chocolate raspberry hummus! Replace some of the vanilla extract with orange, mint, etc. The sky’s the limit to what you can do! Chickpeas. To make this Chocolate Hummus recipe I used a 15 oz can of chickpeas. You can use 1 1/4 cup of cooked chickpeas if you like to prepare your own. White beans (northern beans) can also be used in place of chickpeas! Peanut Butter. Any nut or seed butter works well in this recipe! Peanut butter is my favorite, however some other ideas include: tahini, cashew butter, almond butter, sunflower seed butter, etc. Choose your favorite and one that fits your dietary needs! Honey. Maple syrup can be used in place of honey for a vegan version! However honey is my favorite in this recipe! Coconut Sugar. Any granulated sugar works well in this recipe. Also, if you like your chocolate treats extra dark and not too sweet you may be able to reduce the amount of coconut sugar. My goal was to make a Chocolate Hummus that my entire family enjoyed, but I could have definitely used 2 TBS coconut sugar! You can replace the coconut sugar with more honey or maple syrup as well, however I appreciate the texture and taste the coconut sugar imparts in this dessert hummus recipe! Cocoa Powder. Use your favorite unsweetened cocoa powder. For a dark version use a dark cocoa powder! Almond milk. To make this Chocolate Hummus recipe I use unsweetened vanilla almond milk. Literally any dairy-free or regular dairy milk can be used with great results! Just be sure to choose one that complies with your dietary needs. Sea salt. Depending on the salt content of your peanut butter you many not need much salt. I recommend starting with 1/4 tsp and adding more if necessary. Healthy Chocolate Hummus Recipe is easy to make and ready in 5 minutes! It's a nutritious dip, appetizer, dessert snack or spread that everyone in my family, including my kids, loves. This dessert hummus recipe is gluten-free, dairy-free, has no refined sugar & it's vegan! Put all ingredients in the order listed into the container of a Vitamix Blender. Blend, starting on low speed and increasing to high, for 45-60 seconds or until the mixture is smooth. You may need to stop, scrape down the sides, and blend again. *Or any granulated sugar of your choice. **If necessary, add more almond milk to achieve your desired consistency. ***This chocolate hummus can be served at room temperature or cold. I find that it tastes even better the second day, so it’s a great make-ahead dip or spread for a party! I quickly made this this afternoon; it is DELICIOUS! It’s my new favorite along with peanut butter. I’m SO glad you enjoyed it Emily!!!! You can see why we love it so much! Just made it and it surprised me how good it tasted!!!!! Reminds me of brownie batter. Thanks for this awesome recipe! To make it even healthier still, I use organic raw cacao, unfiltered raw honey or 100% pure maple syrup and organic peanut butter (no sugar, added oils or preservatives)!